Normally I use a 90cm dish. 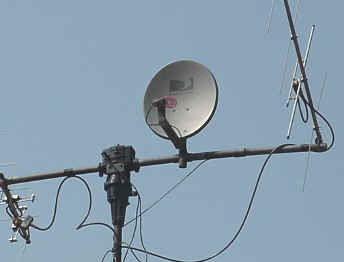 Today I am testing a 18" DSS dish. The test setup show above. Outside is a 5 1/2 turn helix and a 13ULNA preamp. Inside is the power inserter for the 13ULNA and the TranSystem 3733 converter and the 3733 power inserter. More tests to follow. See the same setup with a 2 1/2 turn helix here.